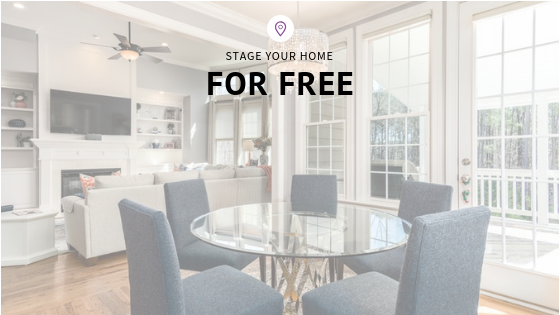 Do you think it costs a lot to stage your home? When it comes to selling a home, appearance is everything. Home staging can make all the difference. One of the most common mistakes sellers make is assuming they need to sink a bunch of money into home staging. Some choose the expensive route and hire a professional home stager, but that’s not the only way to impress potential buyers. From cleaning to rearranging, here are some cost-free tips for revamping your home before you list it. When cleaning your home, focus on making it as clean as a hotel. Dust, vacuum, mop, and wash everything – even the pets. Even if you consider yourself a neatnik, you’re probably going to need to do a little extra work to get your house ready for buyers. All that stuff littering the surfaces of your home has to go. It’s impossible to stage a home when it’s cluttered. Focus on making sure bathroom and kitchen countertops are clutter free and hide bulky kitchen appliances away in cupboards. Eliminate piles of mail and magazines, collections you have on display, knickknacks, and most other items that can easily be packed away. The most important step to staging your home is getting rid of personal items such as photos, albums, handmade items, trophies, and mementos—even the kids’ artwork on the fridge. Keep your personal items tucked away so the buyer can picture themselves living in the home. Now that your home is clean and uncluttered, it’s time to brighten things up so buyers can actually see it. Natural light is a key selling point for any home. Blinds should be kept up, and curtains tied back in order to make the space look bigger, and highlight the views of the outside. Get rid of extra furniture and extra storage space. Not only does this go hand in hand with making things look less cluttered, but less furniture will also make the rooms look bigger. Consider adding fresh flowers to each room. Define each room so that buyer​s know how to make the most of every space. Check out my Get Creative With Your Flex Space article to help with some bonus space ideas.